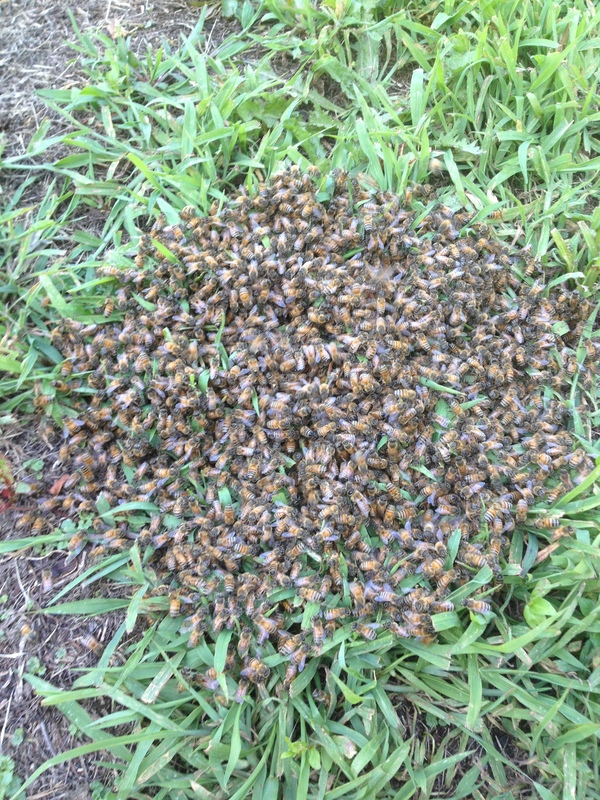 Swarms in Connecticut are unusual in late summer but not unheard of. 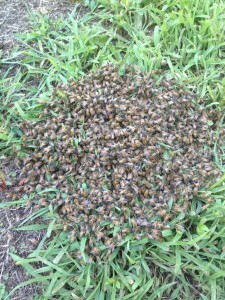 Yesterday I was called by someone who had seen a lot of honey bee activity on their neighbor’s lawn. When I arrived, I was surprised to find that it was a swarm, and rather than forming a cluster on a tree or bush it had formed on the ground. 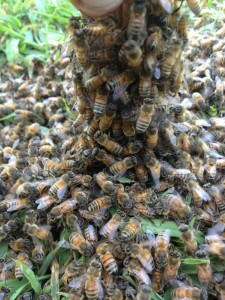 This small swarm is in an unusual location: on the ground rather than in a tree or bush. 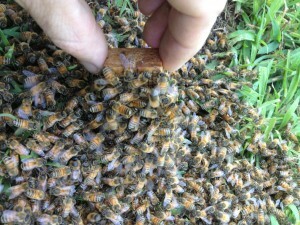 Gently probing the cluster, it was easy to locate the queen. Since a queen will rarely sting, the best way to capture her is to simply pick her up, taking care not to injure her. Hold her in a loose fist so she is in a cavity inside your hand and place an empty queen cage in the opening by your thumb and index finger. In just a few seconds the queen will move toward the light and enter the cage. Once that has happened, close up the opening in the cage with a cork or a piece of beeswax. The swarm queen, successfully captured. One the queen is captured, the swarm is yours. 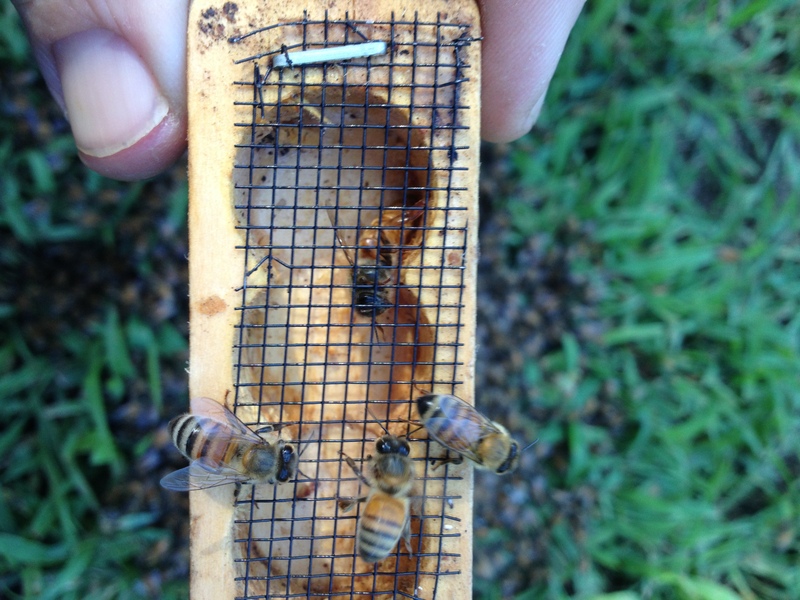 The honey bees quickly realize that the queen is in the cage and begin to cluster around her. 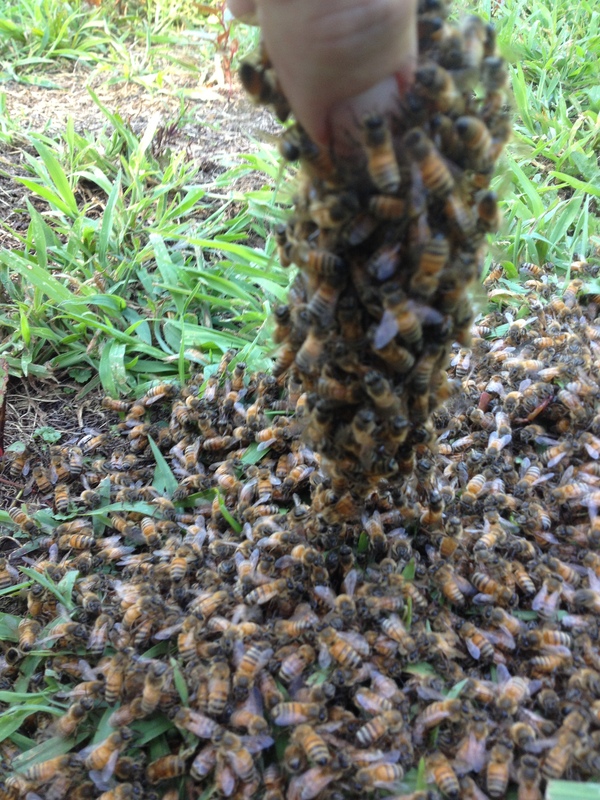 In just seconds, the honey bees begin to cluster around the queen. 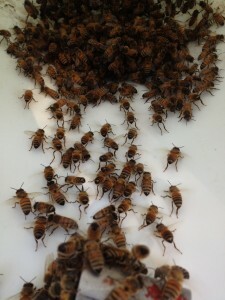 More honey bees join the cluster. Even more honey bees join the cluster. 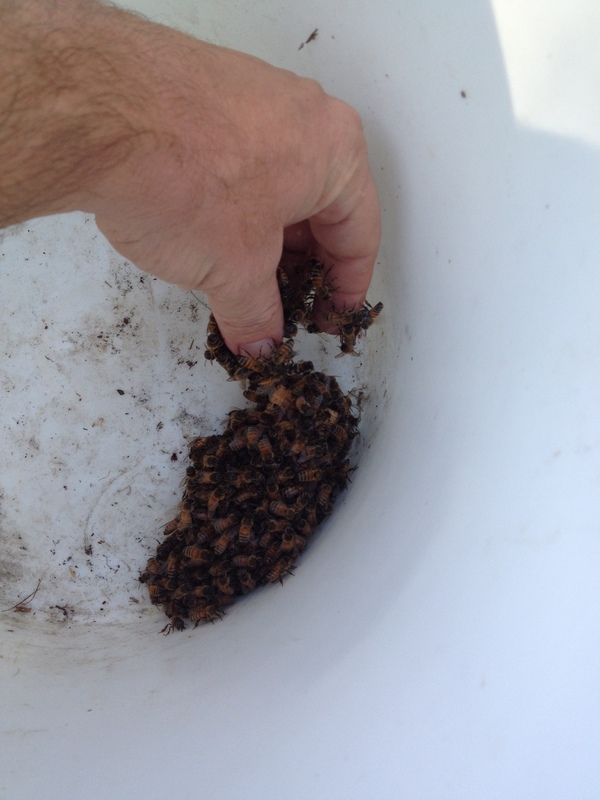 A 5-gallon bucket is a good way to transport a swarm. 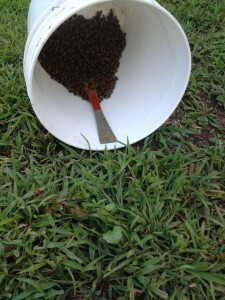 Place the queen cage and clustering honey bees on the bottom of the bucket. 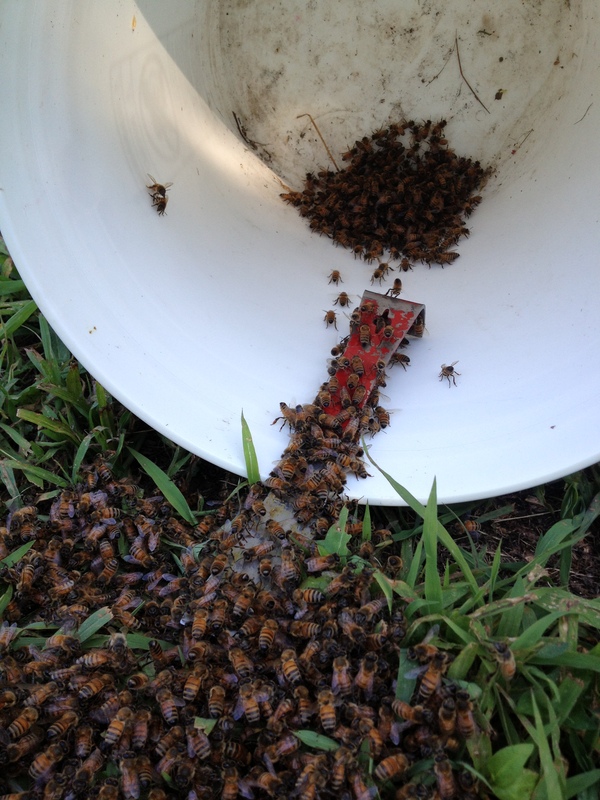 Place the queen cage and clustering bees on the bottom of the bucket. 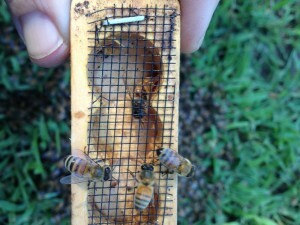 Very quickly, the honey bees will start to move toward the queen. 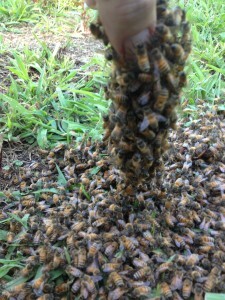 The honey bees begin to move toward the queen. The bees in the cluster, previously facing in random directions, begin to align themselves toward the queen. The honey bees on the ground begin to align their bodies, pointing toward the queen. How do the bees in the grass know where to go? 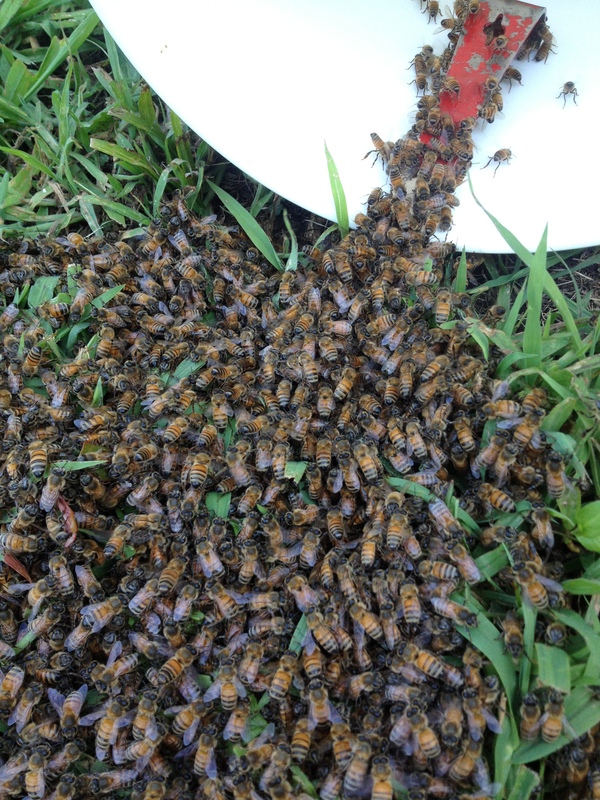 They are being directed by the bees in the bucket. 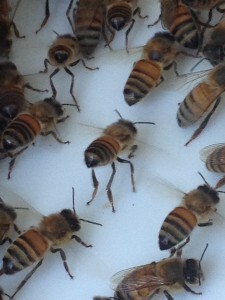 One of the ways honey bees communicate is with pheromones. The Nasonov pheromone is used to direct honey bees toward the hive. Honey bees face the queen, raise their abdomen in the air, extend their legs, and bend the stinger downward, which exposes the Nasonov glands between the last two sections of the abdomen. These glands secrete the pheromone. At the same time, the honey bee beats its wings, dispersing the pheromone outward, thereby directing other bees toward the queen. 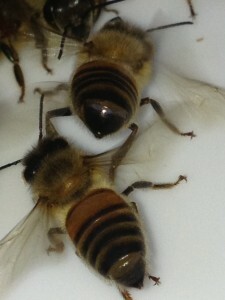 Honey bees spreading the Nasonov pheromone, directing bees toward the queen. A honey bee dispersing the Nasonov pheromone. As they approach the queen, more and more honey bees begin dispersing the Nasonov pheromone, making it easier for the remaining bees to join them. More bees disperse the Nasonov pheromone. 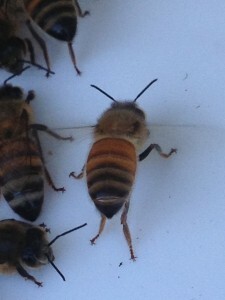 The bee in the center is in the classic position: legs extended, abdomen raised, stinger pointed downward, and wings beating. The Nasonov glands are between the last two sections of the abdomen and are exposed when the abdomen is raised and the stinger is pointed downward. In about 30 minutes, all of the bees have moved from the ground into the bucket. Simple! 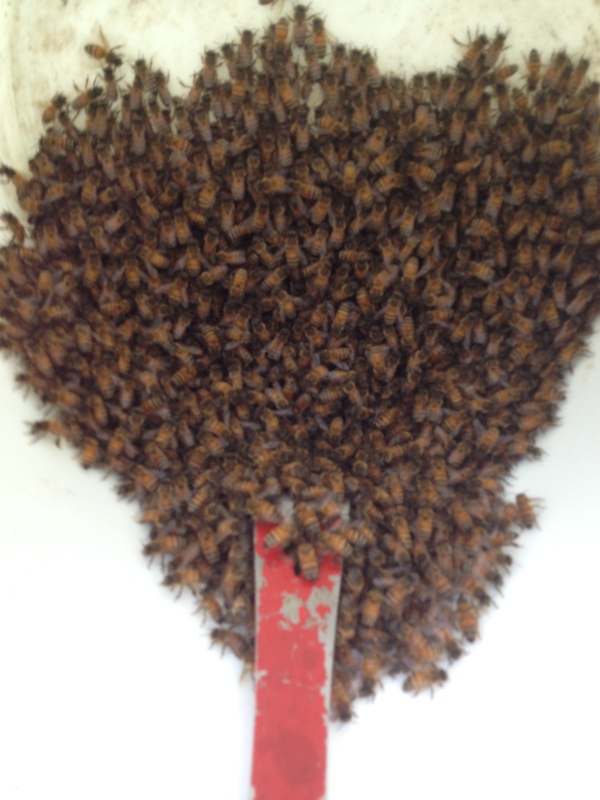 The swarm has moved into the bucket, with little effort on my part. 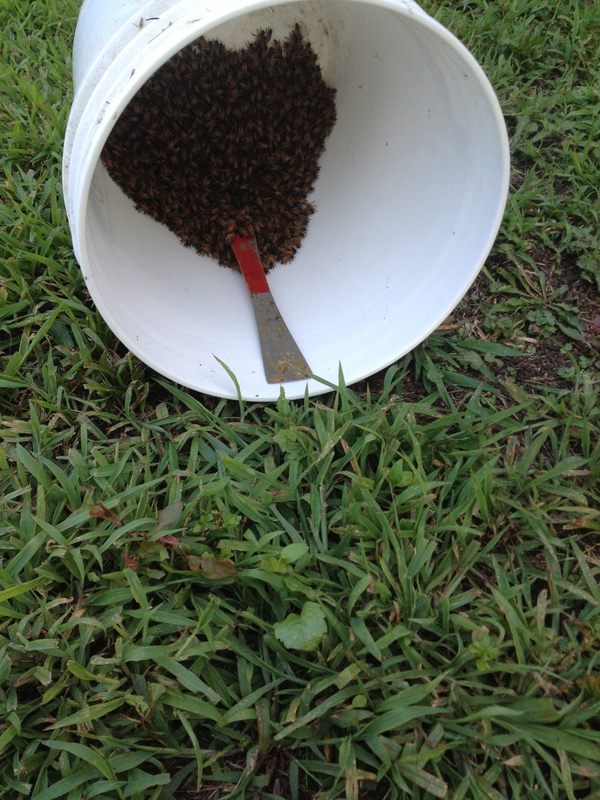 Now, with a piece of window screen placed over the top and secured with a string wrapped around the bucket, the swarm is easily transported to their new home. If it will be more than a day or so, be sure to spray them with a little sugar water for nourishment.